It’s been clear for years, but now it’s on paper. Mississauga councillors have unanimously endorsed asking Premier Doug Ford to allow the city to separate from Peel Region as part of the current review of regional government. 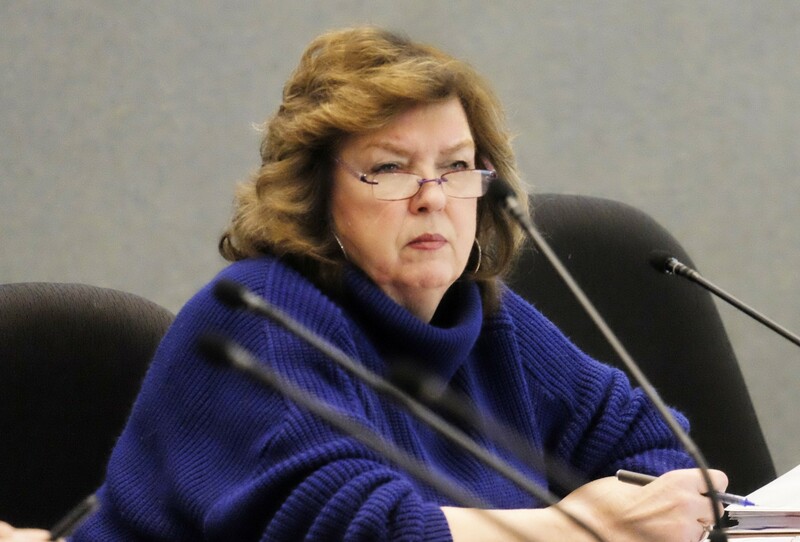 Wednesday’s move wasn’t the first attempt to push Ford’s advisors in a certain direction, but Mississauga may be the first municipality to push for separation. Last month, Burlington and Oakville councils both passed motions urging Ford to leave Halton Region as it is. None of this should come as a surprise to the more than 720,000 residents of Mississauga, Canada’s sixth-largest city. 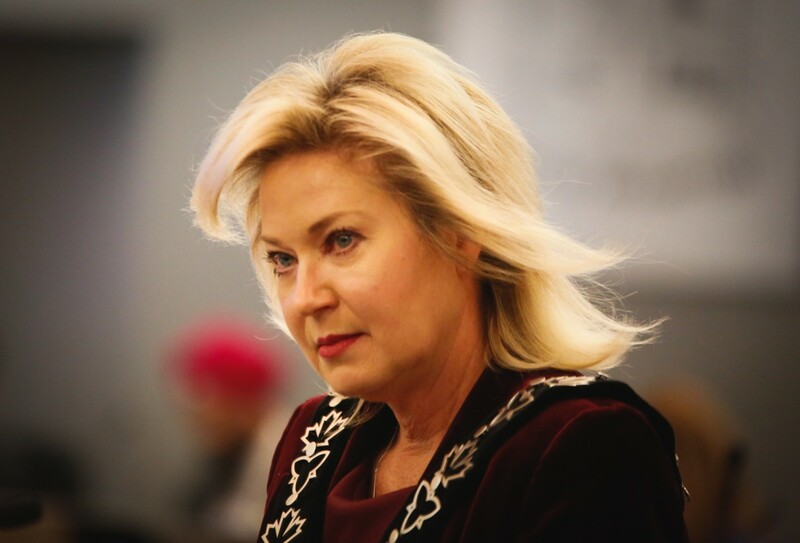 Mayor Bonnie Crombie has been pushing for the city to go it alone long before the regional governance review was announced earlier this year. Prior to her successful mayoral run in 2014, Crombie's predecessor Hazel McCallion had for years advocated for the same thing. It was a position that put Crombie at odds with former Brampton mayor Linda Jeffrey, often an ally of Crombie on other major issues, who on the topic of regional governance felt a departure by Mississauga would be unfair to Brampton because the smaller city had helped pay for much of Mississauga's rapid growth in the '80s and '90s, while city leaders there didn't seem to realize that it is Brampton's turn to get help from its neighbour by subsidizing through regional government the ongoing development of the country's second fastest growing city. Jeffrey said that a Mississauga exit would cost Brampton tens of millions of dollars in costs that local taxpayers would have to shoulder on their own after helping pay for those same costs in Mississauga before it reached its build-out. Mississauga staff and its political leaders have refuted this claim, stating their city has not only covered its fair share of recent growth, but has also covered a disproportionate share of costs in Brampton and Caledon. The motion was passed unanimously, but only in principle. Before submitting the request to the province, Mississauga plans to hold a public meeting to hear from residents. Ford advisors Ken Seiling and Michael Fenn have been meeting with regional stakeholders across the province as part of the provincial review, which has been marketed as a deep dive into a system that has not been reviewed for decades. Peel was created in 1974 under the Conservative government of Premier Bill Davis, back when the populations of Brampton, Mississauga and Caledon were a fraction of today’s size. Brampton had about 91,000 residents, dwarfed by Mississauga, with 222,000. Caledon was a tenth the size of Mississauga, with 22,000 people. Which direction the province takes will not be known till the summer, when the review report is to be released. However, Wednesday’s motion appeared to come in response to speculation that the province, rather than separating Mississauga from the region, may decide to amalgamate Peel Region into one super-city, something Crombie says is out of the question. Mississauga’s separation from Peel Region would raise big questions for Brampton and no doubt draw intense debate around the regional council table. A moment of unity. 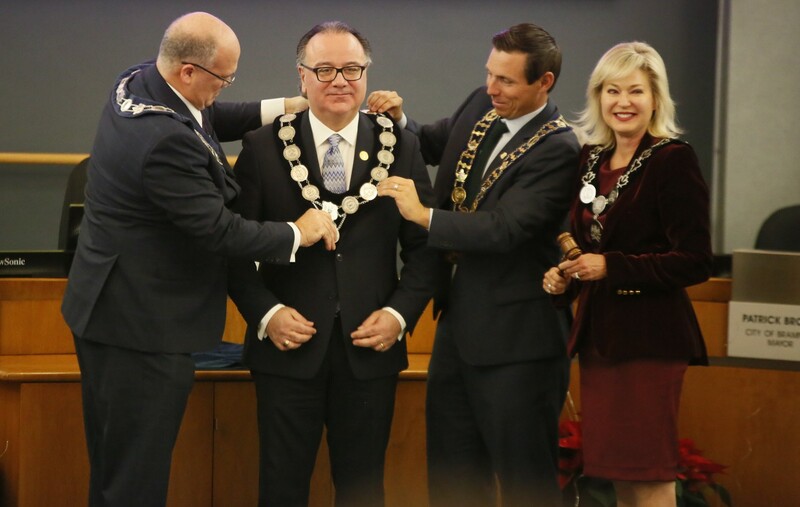 Regional Chair Nando Iannicca is sworn in as regional chair surrounded by Peel's three mayors. Iannicca believes Peel Region is a model of governance that works well. If the region broke apart, with Brampton and Mississauga becoming single-tier municipalities, Caledon could either be left to fend for itself or amalgamated into Brampton, which would heavily burden the country’s ninth-largest city. Effectively, Brampton would be saddled with subsidizing future growth in largely rural Caledon. Brampton has argued that it has had to pay into the region for decades, assisting in Mississauga’s growth, but would lose out on help from a more mature Mississauga now that it is in its own period of rapid development and population boom. Brampton is expected to grow from about 600,000 residents currently to more than 900,000 by 2041. “(It’s) a fundamental concern,” Regional Chair Nando Iannicca has previously told The Pointer, noting that Caledon would probably be hit hardest if the region is dismantled. Crombie argues that Mississauga’s contribution to the region is “not fair” compared with what the city is getting in return. When it was created in the 1970s, the regional government model was meant to help consolidate services smaller municipalities would have trouble providing on their own, such as policing, water utilities and major roads. In a report presented to Mississauga councillors during its March 20 general committee meeting, staff laid out a trio of potential options for the city to consider as possible outcomes of the review: amalgamation with Brampton and/or Caledon, some type of regional government reform, or the much desired single-tier status. How Mississauga would manage to extricate itself from Peel Region, where so many services are provided jointly, such as policing and water infrastructure, was not addressed in the report. “Those details will depend on Provincial decisions, timelines and processes,” the document states. Further, the report argues that property taxes in Mississauga are being pushed upward because the city is shackled to the region.